Add minimal bulk to your Apple Watch and keep the glass touch feeling while providing full corner protection. Compatible with Apple Watch Series 3 / Series 2 /Series 1 / Sport Edition- Apple Watch is not included. 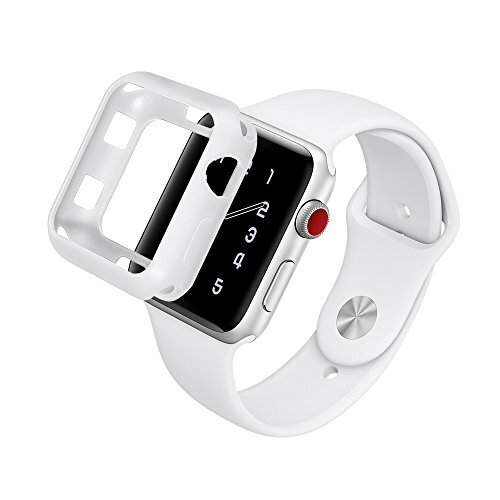 *Package included: 1 x 38/42mm Apple Watch Band + 1 x Apple Watch Case, and we will send 1x Apple watch screen protector as our free gift to you. *Fully protects the body and edges of your Apple Watch from bumps and scratches. *Durable and flexible soft TPU material covers your Apple Watch side and edges perfectly. Shiny, shock-proof and shatter-resistant. Precise hole cutouts allow easy access to the screen, the power button and the Digital Crown. Reserved holes on the back is for quick band release. * Excellent in shape and craft, high ability in toughness, abrasion resistance & durability. If you have any questions about this product by Millton, contact us by completing and submitting the form below. If you are looking for a specif part number, please include it with your message.